On 10th January, 2019 Professor S.K. Srivastava, the Vice-Chancellor of NEHU, Shillong and Professor Bundhit Eua-arporm, the President of the Chulalongkorn University (CU), Bangkok signed an MoU in the presence of His Excellency Chutintorn Gongsakdi, the Ambassador of Thailand to India and his counterpart Her Excellency Suchitra Durai, the Ambassaador of India to Thailand, Associate Professor Apisak Dhiravisit, Deputy Director of the Thailand Research Fund, members of the delegation from NEHU and a host of dignitaries. The MoU was the outcome of the earlier visit of Her Royal Highness Princess Maha Chakri Sirindhorn to North-Eastern Hill University, Shillong and followed by the visit of the members of the delegation from Chulalongkorn University. 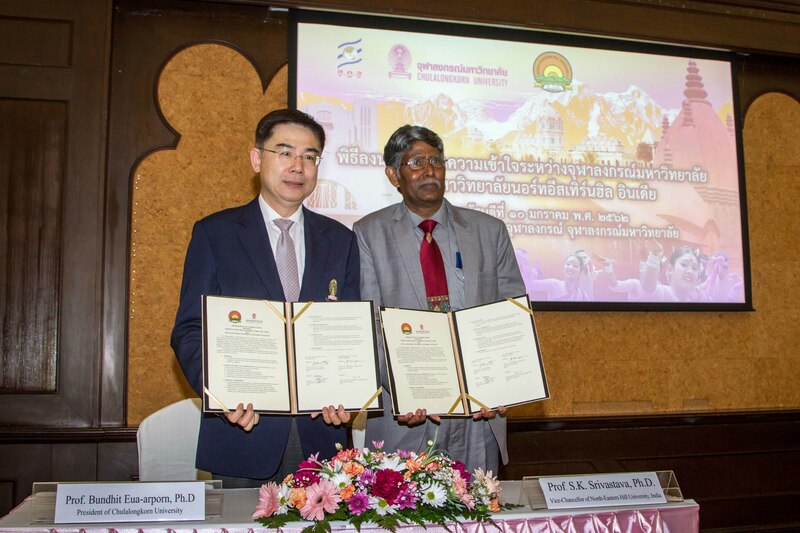 The MoU signed ensures and guides concrete cooperation between the two Universities in compliance with Her Royal Highness Princess Maha Chakri Sirindhorn's initiatives to promote Academic cooperation between Thai & Indian Educational Institutes. It is also noteworthy to inform that under the terms of reference of the MoU, scholars from both Chulalongkorn University and NEHU will embark upon the research project entitled "CU-NEHU Innovative ASEAN-India Academic Cooperation". The project enjoys the patronage of Her Royal Highness Princess Maha Chakri Sirindhom and is supported by the Thai Research Fund. The MoU was signed in the precincts of the palatial Maha Chulalongkorn building which had also hosted Gurudev Rabindranath Tagore when he visited Thailand in the year 1927. The Vice-Chancellor of NEHU was also the Chief Guest of the subsequent event "World Hindi Day 2019", which was observed by Chulalongkorn University on the same day and a message from Sri Narendra Modi, the Hon'ble Prime Minister of India was also read during the celebration.